Yesterday I shared an alcohol free beverage option in my Pot ‘O Gold Punch. Today, it’s all about the adults. 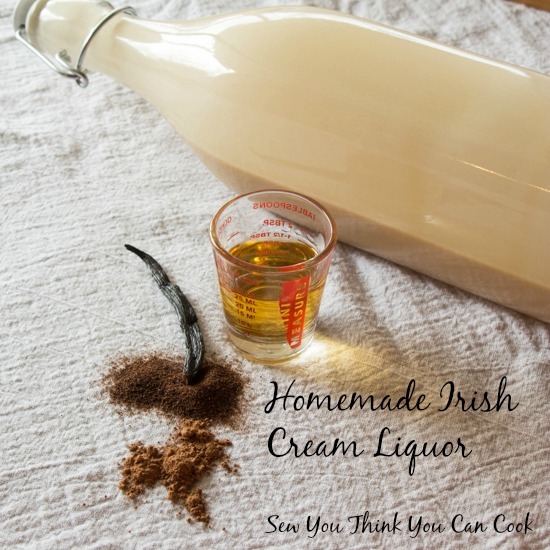 Making Irish Cream Liquor at home is simple, quick, and easy. And better yet, actually tastes like the real thing. Although my mom thought it was a tad weaker than the stuff in the bottle. You can enjoy this liquor straight out of a glass with ice, over ice cream, or use it in a new favorite dessert. The latter is a teaser for a recipe coming at you next week, so stay tuned! This recipe makes 3 C and will keep up to 2 weeks in the refrigerator. Whisk together 1 tbsp heavy cream with the espresso and cocoa powders until smooth. Whisk in remaining ingredients. Store in an air tight container up to two weeks in the fridge. Quite! I used mine in cheesecake, too. Yum.